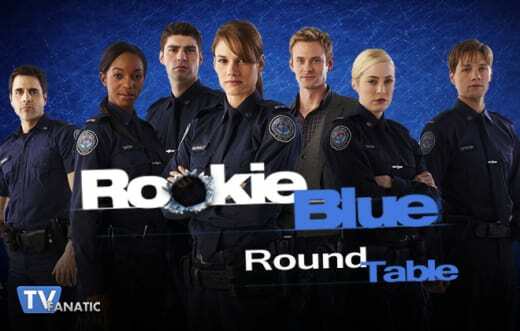 Sam and Andy celebrated their engagement, as Traci’s love life took a turn for the worst and Oliver’s career hung in the balance on Rookie Blue Season 6 Episode 7. Below, TV Fanatics Elizabeth Harlow, Allison Nichols, Whitney Evans and Christine Orlando team up to debate their reactions to Steve’s guilt, what Traci should do now, if Duncan Moore is involved and their favorite moments from "Best Man." Were you shocked that Steve Peck appears to be the man who set the bomb? Allison: Definitely! We saw last week that Steve has done some shady things, but this is a whole new level. Whitney: I'm still in shock! I was always a fan of Steve and I can't believe he's a dirty cop. I guess last week was setting us up to show him in an unfavorable light, but I never thought he was capable of that. Christine: Yikes! I like Steve. I’m hoping there’s still some sort of explanation but it certainly doesn’t look good. What should Traci do now? Elizabeth: That's a tough one. Obviously Steve is more dangerous and conniving than anyone thought, so she has to play this safe. Telling Andy and Sam is a good first step, but they'll need to gather more evidence against him. Allison: She needs to tell people, at least Andy and Sam. Then, they need to come up with a game plan. An ID by Chris is a good start, but they will need more than that. Oliver might be able to help explain how his ID card went missing, but he probably shouldn't be told the full story. Oliver's been set up by Steve of all people, and he might not be able to play it cool if he's ever around Steve. Whitney: First off, poor Traci! You get another chance at love and your boyfriend is clearly a very messed up man. She is going to tell Andy, who is going to tell Sam and I think they will come up with a plan to expose Steve. Things are going to get very messy, for Traci, Gail, Oliver and all of our 15 gang. Christine: She has to tell Sam and Andy…and then somehow act normal around Steve until they figure out what to do next. That’s going to be incredibly difficult on her. What a mess! Do you think Duncan Moore is involved in the corruption at 15 Division? Elizabeth: I'm not sure that Duncan's smart enough to be part of the corruption - if he is, it's probably unknowing on his part. He would make a pretty good patsy. Allison: Not really. It doesn't seem like Duncan. I do agree with Elizabeth that if he is involved, it would be without him knowing. Whitney: From the looks of things, I'm going to say no. I also don't think he's smart enough. Christine: Wouldn’t it be great to find out that Duncan is actually some sort of evil mastermind…but no. I don’t see it really happening. No one could be that good at playing dumb. Was there anything in “Best Man” that disappointed you. Elizabeth: I thought it was a little silly they didn't immediately show the guy Oliver's picture to confirm the ID. Allison: Same here! They didn't ask for a description of this "Oliver Shaw" or anything. They just took his word and went to tell Oliver. It didn't make sense at all. Whitney: Yeah, I agree with Elizabeth and Allison. Why Sam and Andy never made that guy ID Oliver was a head scratcher. Christine: Since you all have already picked mine, I’m going to go with Traci’s love life being trashed once again. She’s had a messy divorce and custody battle with her ex, then Jerry was killed, and now this! When does Traci Nash catch a break? Elizabeth: Tie between Sam "proposing" to Oliver, which was both funny and touching, and Sam's gift to Andy, which was hilarious. Allison: "They're going to bury you, brother." That quote broke my heart, and the whole scene where Sam and Andy tell Oliver was really well done. Whitney: I'm with Allison. The whole scene with Oliver was heartbreaking and so well acted. Just thinking about it now makes me weepy. Christine: Sam giving Andy the quaking ring finder. It was the laugh I needed in an otherwise angst filled episode. 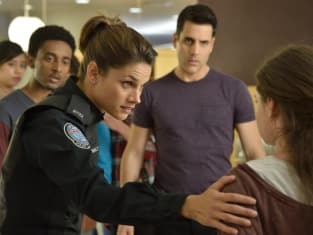 Check back with us this Thursday for our recap and review of Rookie Blue Season 6 Episode 8 and if you can’t wait for more, you can always watch Rookie Blue online here at TV Fanatic.